The choice of gait, that is whether we walk or run, comes to us so naturally that we hardly ever think about it. We walk at slow speeds and run at high speeds. If we get on a treadmill and slowly crank up the speed, we will start out with walking, but at some point we will switch to running; involuntarily and simply because it feels right. We are so accustomed to this, that we find it rather amusing to see someone walking at high speeds, for example, during the racewalk at the Olympics. This automatic choice of gait happens in almost all animals, though sometimes with different gaits. Horses, for example, tend to walk at slow speeds, trot at intermediate speeds, and gallop at high speeds. What is it that makes walking better suited for low speeds and running better for high speeds? How do we know that we have to switch, and why don’t we skip or gallop like horses? What exactly is it that constitutes walking, running, trotting, galloping, and all the other gaits that can be found in nature? Researchers led by Dr. C. David Remy at the Robotics and Motion Laboratory (RAM-Lab) at the University of Michigan are interested in these and related questions for a very simple reason: they want to build legged robots that are agile, fast, and energy efficient. The ability to use different gaits might be a crucial element in this quest, since what is beneficial for humans and animals could potentially be equally beneficial for legged robots. That is still a big `could’, since we currently do not know if using different gaits will actually pay off, or, how suitable gaits for robots will look. Are they some form of walking or running, or will they be something completely different? In nature, biomechanics research has shown that the choice of gait is closely related to the energetic cost of transport. This cost describes how many calories one needs to burn in order to move a certain distance. It is an important measure, as for many animals, food is often a scarce resource and efficient locomotion can be key for survival. To understand the implications of gait on the cost of transport, researchers can estimate energy consumption by measuring the amount of oxygen that a human or animal consumes while locomoting using different gaits. Using this technique, it has been shown that at low speeds, it simply requires less effort for humans to walk and at high speeds, less effort to run. The same holds for horses as they switch from walking to trotting to galloping: changing gaits saves energy. 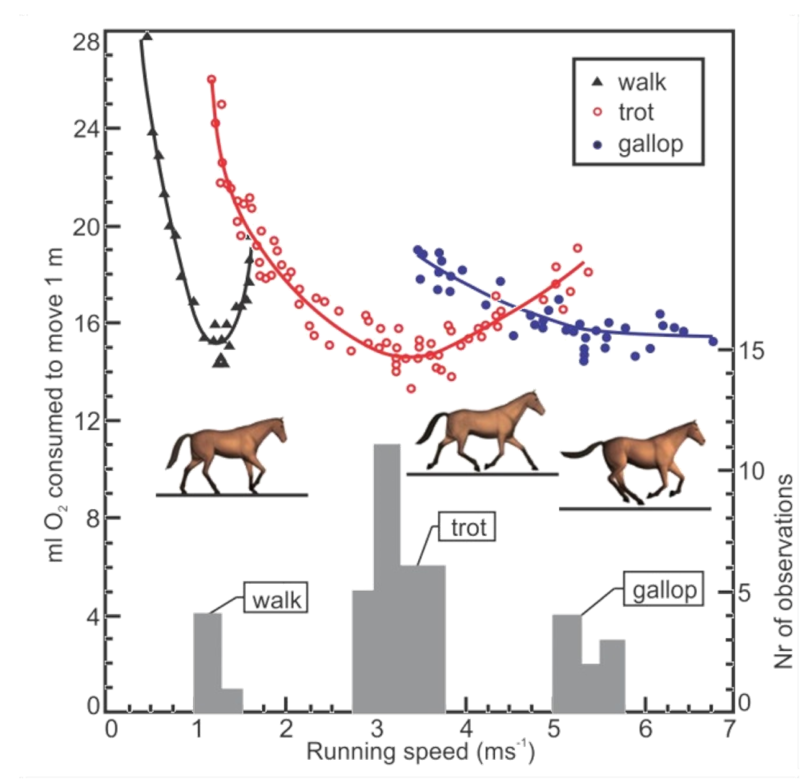 This adaptation of a figure from the Hoyt and Taylor paper “Gait and the energetics of locomotion in horses” shows the metabolic cost of transport as a function of the forward speed. It is clear that as speed increases, there is an energetic benefit to transitioning from walking to trotting to galloping. Furthermore, when horses self-selected their velocities within a particular gait, they tended to choose to move near their energetic minima. In order to understand if the same energetic saving can be achieved in robots, Dr. Remy’s team uses large scale numerical optimization. That is, after building a computer model of a legged robot, they essentially ask an algorithm to automatically find the most energetically economical way of moving forward. That is, they find the motion that minimizes the cost of transport. The computer solves this puzzle by simply trying out -in a systematic fashion- any possible way of using the model’s legs to move forward. The results of these optimizations are remarkable. Even though the computer has no prior notion of walking, running, or gait in general, the optimal motions that emerge through this process closely resemble gaits and gait sequences found in nature. By varying the target velocity of each motion, optimal gait sequences can then be identified. The surprising finding is that there are essentially no surprises: to move with as little effort as possible, bipedal robots should walk at slow speeds and run at high speeds; quadrupedal robots should walk, trot, and gallop. The remarkable thing is that this result was found despite the substantial differences in structure and actuation between animals and robots. Hoyt, Donald F., and C. Richard Taylor. “Gait and the energetics of locomotion in horses.” Nature 292.5820 (1981): 239. Xi, Weitao, Yevgeniy Yesilevskiy, and C. David Remy. “Selecting gaits for economical locomotion of legged robots.” The International Journal of Robotics Research 35.9 (2016): 1140-1154. Xi, Weitao, and C. David Remy. “Optimal gaits and motions for legged robots.” Intelligent Robots and Systems (IROS 2014), 2014 IEEE/RSJ International Conference on. IEEE, 2014. Remy, C. David. Optimal exploitation of natural dynamics in legged locomotion. Diss. ETH Zurich, 2011.